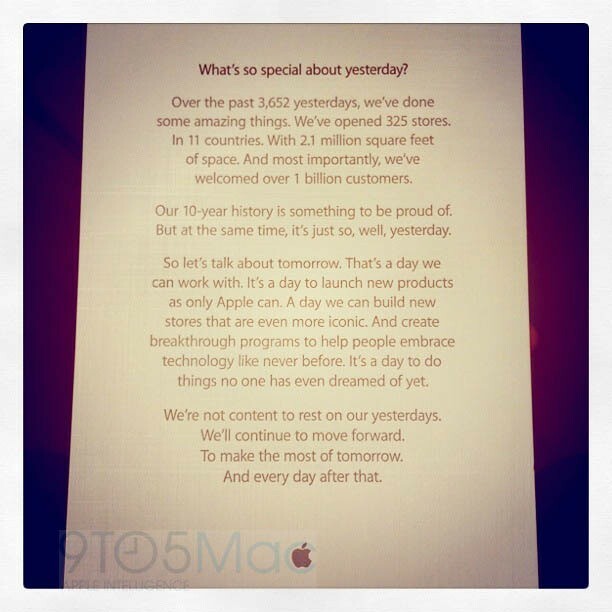 iP3: What’s so special about yesterday? What’s so special about yesterday? Over the past 3,652 yesterdays, we’ve done some amazing things. We’ve opened 325 stores. In 11 countries. With 2.1 million square feet of space. And most importantly, we’ve welcomed over 1 billion customers. Our 10-year history is something to be proud of. But at the same time, it’s just so, well, yesterday. So let’s talk about tomorrow. That’s a day we can work with. It’s a day to launch new products as only Apple can. A day we can build new stores that are even more iconic. And create breakthrough programs to help people embrace technology like never before. It’s a day to do thing s no one has even dreamed of yet.